Did I tell you that I love cats? Yes I did:))) But then, did I tell you that I love doing puzzles? The other one is “Laces” by Rosina Wachtmeister, in awesome colors and gilts on the faces of the cats and the sky. The lace details and the cuteness of the cats is adorable :)) You should visit Rosina Wachtmeister’s website and see where she lives, her workshop, her cats and works.. It’s dreamy..
Laces’s frame is ready, I scavenged it from trash and repaired with modeling putty to restore deformed relief work, then painted like the original in acrylics. It wil be done when I sprat varnish on it and go get a plexiglass board from Karakoy- which I somehow could not manage to find in Besiktas or Sisli. Actually, a DIY/Recycling video/post with before-after shots and steps in the making would have been great. Kedileri çok sevdiğimi söylemiş miydim? 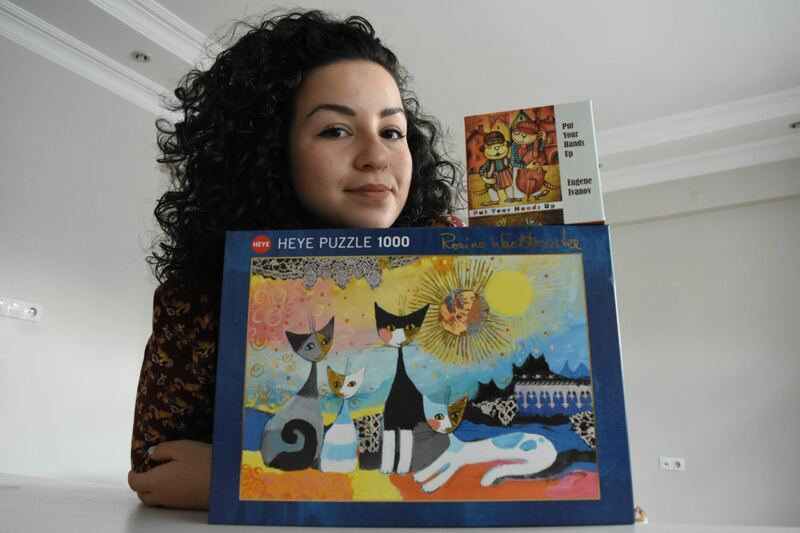 Söylemiştim:)) Peki ya puzzle yapmayı çok sevdiğimi söylemiş miydim?